It comes as the province of Hesse (which houses the country’s financial capital Frankfurt), two weeks after the province of Bavaria did likewise, decided to vote against the government parties, Ms. Merkel’s CDU and the Socialist SPD who are together in a ‘grand coalition’ (the GroKo). Ms. Merkel’s CDU lost 10% since the 2013 election in Hesse and slumped with 28% in what is the party ’s worst election result since 1966 in the province. Her loss mostly went to the anti-immigrant AfD who took some 13% of the vote share. 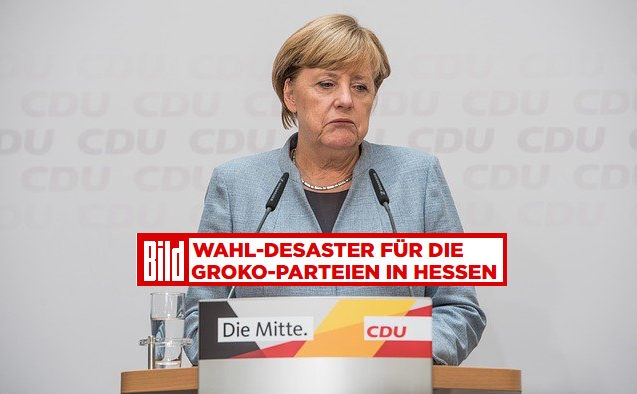 Related coverage: <a href="http://thegoldwater.com/news/40472-Germany-Merkel-s-Guaranteed-Weekend-Hesse-Election-Disaster-Video"> Germany - Merkel's Guaranteed Weekend Hesse Election Disaster (Video)</a>. Meanwhile, her socialist government colleagues of Ms. Andrea Nahles’ SPD tanked to just 20%, with the Green party almost surpassing them for second place. The result, the SPD’s worst since 1946, will pile pressure on the party leader, MsNahles, and in the most extreme potential outcome could be the shock that triggers the SPD’s withdrawal from Merkel’s coalition in Berlin, a move that would always force fresh federal elections. With it all said an spun…..
She is still the SOCIALIST Chancellor as soon as she cobbles together a few Left Leaning parties to join her. Which will likely take her further LEFT. The USA should just pull its troops out of Germany and demo the bases and Housing IF they refuse to pay for them. Only then turn over the bases and leave. Don't given them $$Billion in a Gift like we did France that continues to spit in our faces and side with Russia.